A scraper is actually nothing but a piece of sheet steel which is intended, after it has been properly prepared, to take very fine shavings off wood surfaces. It will only fulfil its task when its edges have been given a fine burr. What are scrapers used for? Before sandpaper was in common use, the smooth plane was mainly used to achieve a smooth surface on wood, the scraper served to even out the fine plane marks left behind from its sweeps. Besides this, a scraper can be used to remove old polishes or layers of wax or paint on old furniture. Doing this with a scraper is often much quicker than with a sander. On the whole it can be said that the scraper works better on hardwood than soft. Before the burr comes the edge - which must be straight and at right angles and, above all, clean. The edge of the scraper is prepared with the aid of a fine flat file, if possible without a handle, which would simply get in the way. The file is taken over the edge first at an angle and then with straight strokes. If you are working on a used scraper with a blunt burr, first file the old burr away from the flat side. This really does matter! The old burr must be got rid of. The scraper should be clamped for the purpose - either in the workbench vise or another suitable one. 1. One is to clamp 2 rectangular boards using two clamps, almost to the edge of the scraper, so that the file cannot tip over to either side and is just still able to attack the rough metal. With this method, some wood will, of course, inevitably also get filed. 2. 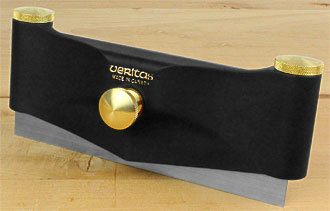 Another is to use the VERITAS jointer & edger. Clamp the file and you can get an exact right angle. See sketch on right. This jointer & edger is to be found on our scraper page. The edge is still not clean enough once filed. Using a rectangular medium-grained grindstone (a 1000 waterstone, for instance), the surface near the edge, and the edge itself, are gone over to remove the marks of the file. To maintain the right-angle in this situation, too, the stone can be held as shown in the sketch on the right, just over the edge of the workbench, while the scraper itself is drawn back and forth along the edge of the bench. The end result must be sharp, clean edges at right angles to each other. No burr must be perceptible any more. Another point: as you see, the stone is resting on edge on the workbench. There is a reason for this - the scraper will make nasty scratches in the stone and so it is better to use the narrow side. It is already possible to scrape and scratch with the scraper as is. However, fine shaving is not possible until you have given it a burr. Today there are round or triangular burnishers available. Which works better is difficult to say, and people's preferences tend to be a matter of habit. The triangular burnisher is used more in Germany but the Anglo-Saxons seem to prefer the round one. Whatever else, the burnisher must be harder than the material the scraper is made of. A. You lay the blade on the bench so that the side requiring the burr is overhanging, and you hold it firmly with the left hand. You hold the burnisher in the right hand with the handle lower than the steel and begin to draw the steel towards yourself, starting at the end furthest away, while pressing it against the scraper. Apply the point of the steelrod to the far end of the scraper and while bringing the steelrod towards you, work it upwards. This method means you will be stroking the edge obliquely and will avoid making scratches in the steel. This drawing motion can be repeated as long as you always do it in the same direction. To achieve a coarser burr angle the burnisher a little and increase the pressure, so that you are working at very slightly less than 90°. B. Another method is to use the bench vice to clamp the scraper and then to proceed as above. Even though the arrows in the sketch suggest otherwise, always draw the steel in one direction, keeping it diagonally accross the edge. Again, by tipping the steel slightly you can increase the size of the burr slightly - but avoid getting more than 10° away from the right-angle. C. Use the VERITAS variable burnisher! It makes the process of putting a burr on a scraper much more easy and more save. You can use it only for rectangular scrapers. The burnisher has to be passed over a clamped scraper. A precision-ground tungsten carbide rod is held at exactly the right angle as you burnish. The angle setting knob can be set to the angle you want and the locking screw will fix it. This varable burnisher is save and reliable. It is available from our scraper page. Important: Because the scraper edge is extremly sharp, the body is designed to be used on the pull stroke. For the safest use, place the cutaway section of the body onto the clamped scraper, then pull the burnisher along the edge. You don't need any hook at the ends because the scraper is bowed in use. It is not necessary to apply great pressure on the scraper while burnishing; repeated passes will roll the edge of the scraper much more consistently and with minimum effort. 1. Clamp the scraper in a vise, leaving about 40 mm (1-1/2 inch) exposed. 2. Put a tiny amount of oil on the scraper edge. 3. With the dial set and locked at 0°, take two or three passes over the scraper at moderate pressure. This will slightly spread the milled face and prepare the edges for the next step. 4. Re-set the dial to the hook angle you want, and take one or more passes to roll the scraper edges. Practice soon tells you how many passes will give you a good edge. Work with the grain of the wood, and not against it or across it, for otherwise all you will achieve is rough patches. If the intention is to strip the wood afterwards by pickling, the scraped surface must be washed down beforehand and finely sanded when it is dry (a grain size of 220 upwards). Scraping can squash fibres that will be raised by subsequent wetting. These raised fibres will be removed by the sanding. Use scrapers of different thicknesses. Over time you will work out for yourself which jobs go best with which scraper. A rule of thumb is that the thinner the scraper, the finer the work, and vice versa. Always have a collection of scrapers ready, both for sharpening and for a stint of work. It will save you preparation time and also the irritation of having to break off constantly from a job you are on in order to sharpen the tools. If the scraper has got blunt the burr can be renewed several times using the burnisher at a more oblique angle. Once these methods cease to be effective, you have to go back and begin by getting rid of the old burr by filing. Of the many things influencing how well scrapers perform, the 4 most important are: 1. Size and sharpness of the burr 2. The angle of the burr 3. Working with a less or more bowed shape 4. Clean filing and grinding before you make the burr. Working with a scraper will soon initiate you into the unpleasant recognition that the friction can cause such heating of the tool that it burns your fingers. In addition, you have to use so much muscle that your hands soon get tired. A scraper holder will solve both problems. Try the VERITAS scraper holder - it enables you to set the curve and keep it, so that you can work on without getting tired. Your thumbs do not suffer from weariness and burns while you are on a long scraping job. Working either away from or towards the body, the effort involved is much reduced. This scraper holder is made for rectangular scrapers with a length of 150 mm (+ - 3 mm). The holder is intended for rectangular scrapers with 150 mm sides (+ - 3 mm). To insert the scraper, the pressure pad in the centre of the holder is unscrewed so that it is withdrawn as far as possible. Then the brass knurled-head screws at the outer edges are released, and their heads given a tap with the fingertips. A conical peg is released, leaving a slot free into which the scraper can be introduced. After pushing in the scraper, tighten the knurled screws just a little - the scraper should still be movable. Now set the screw of the central pressure pad to achieve the curvature you want. Only then should you tighten up the outer screws fully. You have the choice of whether to push the scraper only part-way or all the way inch That choice increases the variations for working. Important: only set the curvature when the outer screws have been loosened! Both ends of the scraper must have room to shift position while the curvature is being changed. When working with the scraper holder it is worth knowing that a slight curvature is appropriate for delicate work and for skimming large areas, and that strong curvature is good for removing more material or working in a narrow channel. However, this advice must be coupled with the nature of the burr: a fine burr for fine work, and a thicker one for coarse jobs. The angle of the burr will also have an effect on the work. VERITAS recommend that you release the fixing screws and wind back the pressure pad when you have finished using the scraper holder. The scraper holder is to be found on our scraper page. And now - all the best and much success in your work!